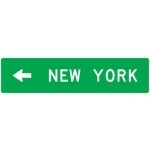 Guide signs are green and white signs that provide mileage and directional information to specific destinations. Directing travelers to the right exit for cities, airports, roadways and many other destinations. 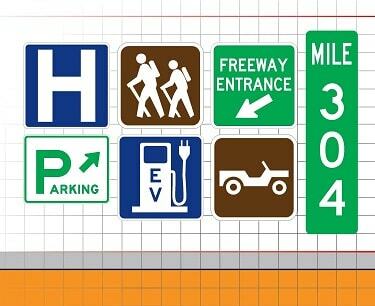 This category includes highway route markers (shields), street signs, mile markers, exit signs, toll road signs, logo service and rest area signs. Whether you are traveling by street, roadway, highway or freeway this simple system of signage helps guide you get to your destination.Best quality every time. Our guide signs are MUTCD / DOT compliant and made with the highest quality .080 aluminum, coated with the industries best 3M or Avery reflective sheeting and printed to last beyond the sheeting warranty.